So our second-to-last port-of-call before arriving in Montreal was Quebec City just up the St. Lawrence. Well, our luck ran out on the run of good weather as we arrived to find pouring rain. Suffice to say, the first half of our day was pretty dreary and I got completely soaked. Fortunately, they turned off the faucet and I was able to enjoy the rest of the day where it became rather warm. 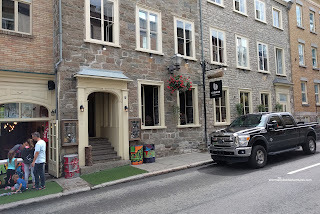 Lovely, now we had to pack away all of our rain gear... Oh well, it was time to eat and in Old Quebec City, we ended up at La Buche. 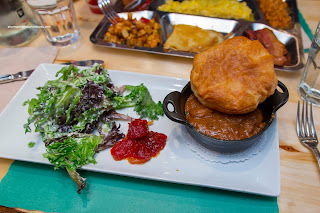 I decided to have the Tortiere which was not traditional as a meat pie per se. Rather, it was prepared in a modern fashion with the meat filling in a large ramekin topped by puff pastry. Hence, it was more a stew more than a pie. I found it meaty and rich with soft potato and tender chunks of beef. The flavour profile was on the saltier side, but still appealing. 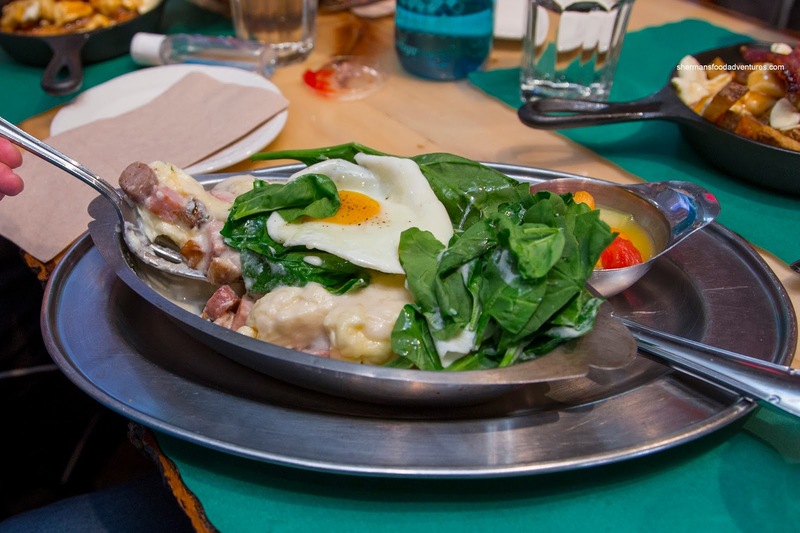 Viv had the Cassoulet made of sausage, ham, bacon and cheese curds coated with a béchamel sauce topped with spinach and 2 sunny side eggs. I found this super rich and meaty despite not looking like a lot. There was an overload of legit cheese curds which made it even heavier. 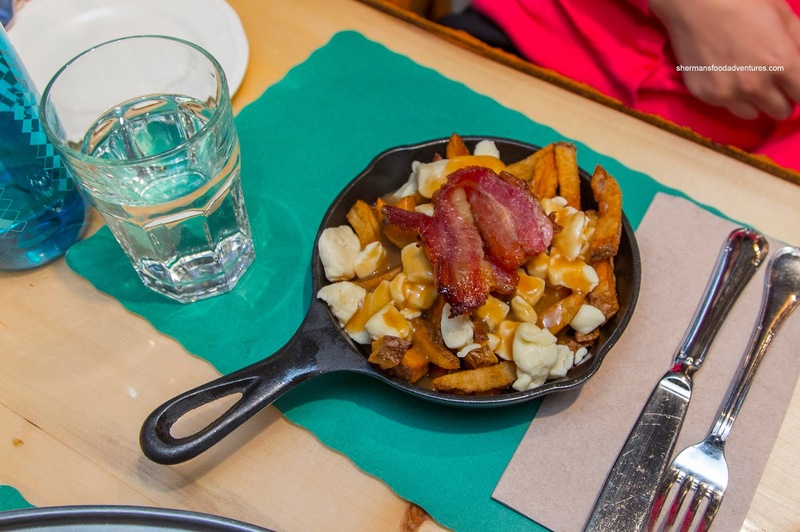 Elaine and my son both had the Bacon Poutine that featured fresh cut fries that were potatoey with only a light crispiness. The gravy was really tasty with a purposeful amount of saltiness accented by the sweetness of cooked down onions. Again, there was an overload of legit squeaky cheese curds. The literal cherry on top was the thick sliced and meaty bacon. 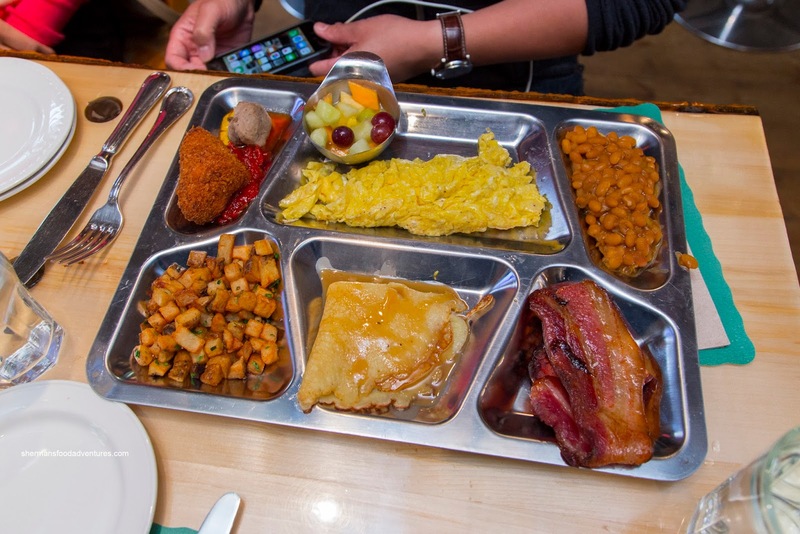 Costanza had the Sugar Shack Combo that featured beans, crepe, hashbrowns, tortiere nugget, croquette and bacon. This was a lot of food where the croquette really stood out being crunchy with a tasty meat centre while the bacon was once again very good. The crepe was tender and sweet. 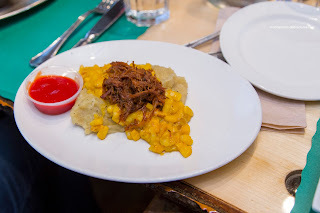 My daughter went for the children’s Shepherd’s Pie that sported smooth mashed potatoes topped with sweet corn niblets and shredded beef. Despite the unappealing visuals, this was probably one of the tastiest items on the table. It was flavourful from the salty beef and sweet corn. In the end, we weren't sure if this was truly representative of Quebec cuisine as this was the only place we visited while in Quebec City. Whatever the case, it did the job and several dishes were tasty.